The OpenOffice.org 2007 Conference officially started on Wednesday, but since I was going for the whole conference I needed to arrive on Tuesday and leave on Saturday. To arrive on Tuesday, I had to leave on Monday, and to get the best flight bargain I'd have to leave on Sunday. Not too bad -- I'd have a day to look around Barcelona. So I dutifully show up ~2 hours early for my flight 3:38 PM flight, and find...that there is no reservation for me. Fun! Apparently something somewhere got screwed up (I still haven't heard what), so the flight arrangements I had made in August were canceled...in August. Oops. Quick phone calls to the travel agency ("what's going on?!") 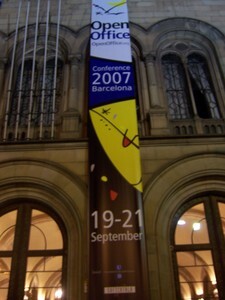 and to my manager got things sorted out in time for the original flight, but with a change in plans; in order to get the cheapest flight, I now would be leaving Barcelona on Monday September 24. This was less than ideal -- it meant that Amber would be alone with Sarah for a day longer than originally planned -- but off I went for my first-ever trip to Spain. When I landed in Barcelona on Tuesday at 11:15 AM, I met up with Kohei, who was kind enough to wait for me even though he arrived two hours prior. Thanks! We continued to wait around for Florian to no avail, because we mis-understood his 12:15 departure time for an arrival time. By 1:30 PM we figured he wouldn't be showing up, so we tried to make our way to the Hotel. That trip was also unexpectedly long, as we had difficulty reading the bus map (can I have a "You Are Here" sticker, please? ), and the bus map at the bus stop was truncated, so that we couldn't see the full path of the bus. Long story short, we got off at the wrong place because we didn't realize that the bus would loop around to drop us off at the right place (ugh! ), but we quickly hit upon the metro to continue our journy. Alas, I also failed to do enough pre-planning, as once we got off the metro at the correct stop (according to hub's instructions), we still needed to find the hotel. As the bus stop was ~6 blocks (and a couple turns) away from the metro stop...this was less than ideal. Apparently we looked dazed-and-confused enough that someone walked up and helped us find our location. Much walking followed. So by 4:00 PM we hit the hotel, get settled in, speak with kendy about fixing my bug, attend a phone conference for our Novell department, and do the ~40 minute walk from our hotel to the Universitat de Barcelona for "dinner" and registration at 7:00 PM (free shirt!). Much talking was had by all.